Grate the onion on the large holes of a cheese grater, placing the grated onion in a mesh strainer where it can drain. Take a small bowl out and add the following ingredients to it, stirring to combine: 1 tablespoon grapeseed oil, coriander, cardamon, paprika, cinnamon, cloves, nutmeg, cayenne, 1 ¼ teaspoon salt, and ½ teaspoon of black pepper. Take a 12-inch skillet* out and pour the remaining oil into it, setting the heat to medium-high. Once the oil’s hot, add the cumin seeds in, shaking the skillet for 30 to 60 seconds or until the seeds smell fragrant. Add the grated onion into the skillet, stirring constantly for 1 to 3 minutes or until any moisture from the onion has evaporated. Add the potatoes to the skillet, turning the heat down to medium afterwards. Continue stirring constantly for 6 to 8 minutes or until the onion begins to brown and a “fond**” forms on the bottom of the bottom of the pan. Add the following ingredients into the skillet, stirring for another minute afterwards: ginger, garlic, and tomato paste. Move all the food from the center off to the sides, placing the spice paste from step 1 into the center, mashing the paste while stirring it around in the center for roughly 15 seconds or until you can smell the spice paste. Mix the paste in with the vegetables now. Pour the water into the skillet, bringing it up to a boil afterwards. 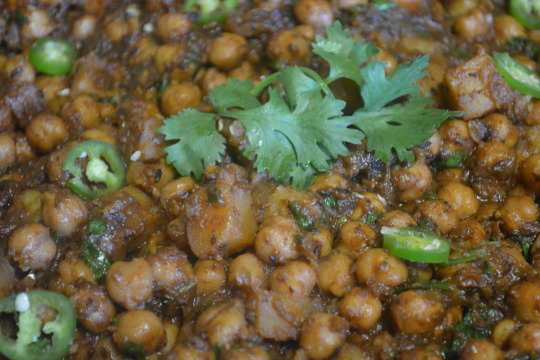 Once boiling, scrape up any browned bits from the bottom of the skillet, adding the chickpeas in afterwards. Once the mixture is boiling again, put a lid on the skillet, turning the heat down to low afterwards. 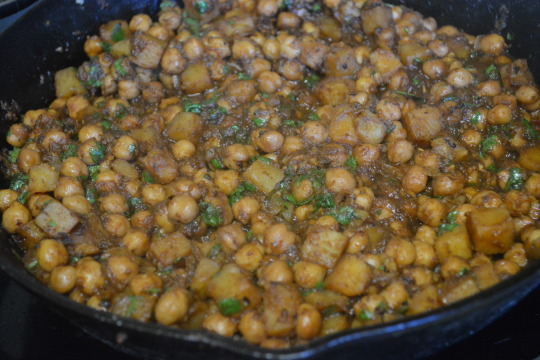 Let the potato-chickpea mixture cook for 13 to 15 minutes or until the potatoes are tender and the oil starts separating around the edges of the skillet. Take the skillet off the heat and mix in the tablespoon of lime juice and ¼ cup of chopped cilantro. Serve individual portions with lime wedges, chopped tomato, chiles, yogurt and flatbread if you want. *They said to not use a nonstick skillet when making this dish so we used our 12-inch cast-iron skillet. **We had no clue what “fond” meant and had to look it up. Turns out, it’s just another term for all the browned bits that form on the bottom of your skillet while cooking ! ***They say it’s supposed to serve 4 but if you decide you don’t want to serve this with the flatbread, plan on it only serving two. Oh this was so delicious ! We knew it was going to taste great simply based off the wonderful smells produced while cooking, especially when we were mashing the spice paste ! Even without the additional optional toppings, this tasted great with the naan bread. That increase in cayenne gave the dish a nice pleasant heat that didn’t overwhelm the other flavors (although a few serrano slices could give you a nice little burst of heat). You can still taste some of the lime juice and cilantro in the background of each bite. We hope you enjoy this filling scrumptious dish as much as we did ! We got this recipe from Milk Street. We weren’t paid in any form to promote Hunt’s, Bush’s or Milk Street.